Our knees, hips, and ankles take a beating in daily life—from trudging up and down stairs to playing games with the kids—because they support our weight, act as shock absorbers, and allow us to run, jump, dance, and dodge. And like the movable parts in a machine, these joints are more prone to problems and can wear out faster than the rest of our body. 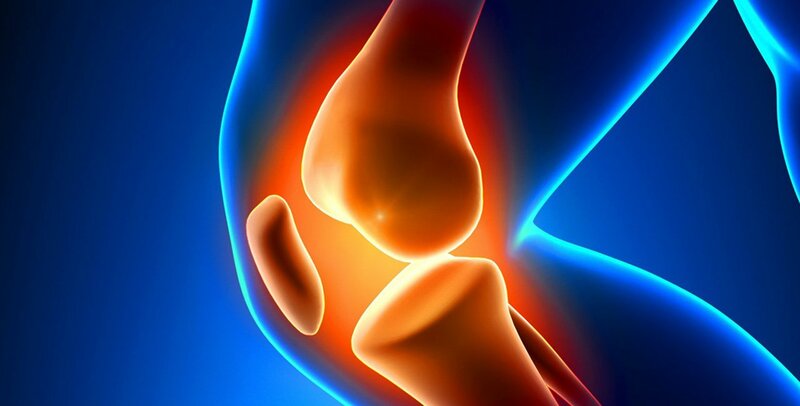 When your knees and joints are in constant pain and need repair, your options can seem limited to over-the-counter or prescription medications with terrible side effects—or you must simply live with the problem. Fortunately, there are clinically studied natural ingredients that can rebuild joint tissue and stop inflammation. Better yet, they are just as effective as prescription drugs but have none of the side effects. Pain is a strong barrier to staying active. If your knees and joints hurt, even the most moderate exercise often becomes impossible, and just walking around the block is a chore. Overall joint health is incredibly important for not only all of those great physical activities—tennis, bike riding, cross-country skiing, swimming, etc.—but also for daily tasks, such as planting and weeding your garden. Many common OTC medications solve pain problems temporarily, but you need nutrients that reduce the inflammation long term; these nutrients will work to build up the structure of the knees and other joints in order to restore healthier levels of functioning. A natural approach to knee and joint health includes ingredients that have been part of traditional medicine systems or integrative practice, but have been improved by recent cutting-edge research. It’s important to use these nutrients in combination because what they accomplish together is even more impressive than what they can do on their own. Curcumin, the active compound within the spice turmeric, has long been used as a treatment for inflammatory diseases. One of its limiting factors, however, has been absorption. The fact is, standard curcumin’s absorption is poor. Because of this, clinical trials have used increasingly larger dosages (up to 10 to 12 grams daily) in order to get even a small amount into the bloodstream. Although no toxicity is associated with curcumin even in high doses, cost, comfort, and compliance can be difficult issues to resolve for many people. The high-absorption curcumin I recommend can eliminate these issues. To produce it, a micronized curcumin extract is blended with turmeric essential oils that naturally enhance absorption. Comparison testing shows that this blended formula has up to 10 times better absorption, and greater blood retention time at significant levels, than standard curcumin extracts. By combining this amazing herb with cutting-edge science, curcumin can reach its full potential and provide life-changing results. Consider this study on rheumatoid arthritis, which randomized 45 individuals into three groups. Group 1 received 50 mg of the nonsteroidal anti-inflammatory drug (NSAID) diclofenac sodium twice daily; group 2 received 500 mg of high-absorption curcumin twice daily; and group 3 received both the diclofenac sodium and the curcumin. High-absorption curcumin was more effective than the NSAID at reducing joint pain and swelling. Furthermore, taking the curcumin with the drug was no more effective than using the botanical alone. Laboratory studies on kidney and liver function, blood sugar, and a complete blood count were performed before and after participation in this study. In general, there were no significant changes in these measurements for all of the groups. No one dropped out of the curcumin groups, but 14 percent withdrew from the NSAID group because of adverse effects. That’s a pretty strong case for choosing an effective, natural alternative. The majority of anti-inflammatory activity in boswellia is linked to the array of boswellic acids found in the extract from the resin of the boswellia tree. Research shows that it’s particularly good at reducing joint pain associated with arthritis. To get the most out of your boswellia product, look for one that has less than 5 percent beta boswellic acid—which can potentially promote, rather than block, inflammatory compounds—and includes at least 10 percent AKBA (acetyl-11-ketobeta-boswellic acid). These qualities separate high-AKBA boswellia from standard boswellia extracts, which aren’t as effective. Curcumin and boswellia are the two key components to pain relief because they reduce the activity of the two most significant pain pathways in the body: the enzymes COX-2 and 5-LOX. In fact, a clinical study of osteoarthritis found that a unique combination of high-absorption curcumin and boswellia was better than the prescription arthritis drug celecoxib (the generic of the brand name Celebrex) in relieving pain; it also improved walking distance and joint line tenderness scores better than the drug. Of course, it’s not just about temporarily relieving pain—it’s about relieving the tissue-damaging inflammation that causes pain. When you use curcumin and boswellia instead of OTC medications, you’re not just “covering up” the pain signals your body sends out; you’re helping your body to heal. Vitamin D deficiency has been associated with inflammatory joint diseases or connective tissue diseases, soft tissue rheumatism, osteoarthritis, back pain, and osteoporosis. Adding to this research is a recent study that examines serum vitamin D levels—a reflection of the vitamin D produced by the skin and obtained from food and supplements—in postmenopausal women. The researchers discovered that 53 percent of the women could be classified as clinically deficient, but only 17 percent actually had sufficient blood levels of the nutrient. Joint pain and joint swelling were reported in both groups. Typically, those with the lowest levels of vitamin D showed a higher average joint pain score. Beyond pain, vitamin D is associated with stronger knee cartilage—the cushioning “shock absorber” of our joints. Another recent study showed a correlation between sunlight exposure (which helps our bodies synthesize vitamin D on our own), serum levels of vitamin D, and the loss of knee cartilage. The authors of the study concluded that sufficient vitamin D levels might prevent—or at least slow down—osteoarthritis-related cartilage loss in the knees. One of the challenges they noted was that vitamin D intake levels and serum levels didn’t always correspond. This discrepancy can be caused by many factors, including absorption and metabolic disorders, which further illustrates the importance of taking supportive ingredients in combination with one another; you can’t always rely on a single nutrient to do all of the heavy lifting. This is where fructoborate—a compound of the trace mineral boron, fructose, and calcium—comes in. The compound is found naturally in fruits and vegetables, and it helps the body absorb and use vitamin D.
This increased absorption of vitamin D helps build bone and elevate levels of dehydroepiandrosterone (DHEA), a hormone that supports the adrenal glands, boosts energy levels, and generally helps you feel healthier. Additionally, fructoborate has been clinically shown to reduce joint pain in just eight weeks in volunteers with severe osteoarthritis. Curcumin, boswellia, vitamin D, and fructoborate will help relieve your joint pain so you can get back to doing what you love. Taken in combination, these natural remedies can not only ease your aches, but also heal and prevent long-term damage. Terry Lemerond is the founder of EuroPharma Inc. and the author of Seven Keys to Vibrant Health.